The murder of a British soldier is just another example of violence between different groups of people. What is the greatest religious divide in our day? It may not be what you think or expect. But what we have in common far outweighs any of the differences we focus on so often. Following recent events in Woolwich, I want to write down my thoughts about the greatest religious divide of our time. Just a week ago a British serviceman was brutally murdered by two men who justified the act by saying that British forces were killing Muslims. The great divide - So what is that divide? You might pick something different, but for me the greatest religious divide is between violent fundamentalists on the one hand and everyone else on the other. Seen in that way, the great majority of Muslims are on the same side as the great majority of Christians, Hindus, Buddhists, atheists and the rest. 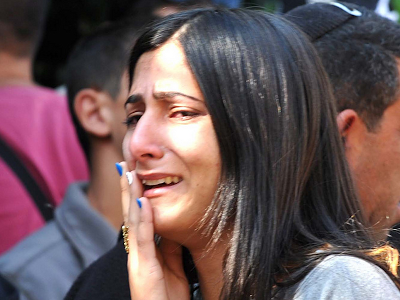 Violent fundamentalists of any faith are a small minority, they always were and always will be. Most people are caring, kind, and want nothing more than to live peacefully and in safety. Fundamentalists are zealous and uncompromising about their beliefs, but only a few would say that violence is justifiable or necessary. And of those that say violence is justifiable, only a few would actually commit a murder. So the men who murdered the soldier are a minority of a minority of a minority. Islam has no monopoly on violent fundamentalism. We see it amongst Christians, Hindus, Jews, and even Buddhists. Standing together - The vast majority of people in this world of any faith and of none must stand together. We must continue to declare peace to one another, to bless one another, and to recognise that all violence is wrong. We must make it clear that we do not accept violence as a way of solving problems and we oppose any person or organisation that does. It's also important to remember that there may be many reasons for committing a violent act, not all of them are based on strongly held religious views. There are also political reasons, personal reasons, mental illness reasons and many more. Perhaps political reasons are the most common. The brutal murder of an off-duty British soldier by driving a car into him and then hacking him to death causes fear amongst ordinary people. On the one hand the fear of Islamic fundamentalism is ramped up, and on the other hand the fear of reprisals against Muslims is also ramped up. It's a double whammy. It's likely that the motive, at least in part, was to raise tensions between Muslims and non-Muslims. We must make sure those tensions are quickly calmed. Peace and vision - To any Muslim in the UK reading this I say 'Assalamu alaikum', 'Peace to you'. I understand that you may be afraid of retaliation, under the circumstances that is natural. It's up to all of us to draw closer to one another, not just within our communities but between them too. Talk to your neighbours of other faiths and of none, understand that they may be just as anxious as you are. I condemn all violence and threat of violence, regardless of who is responsible for it, who it may be aimed at, and whatever reason may be given for it. There can be no justification for one human being injuring or murdering another. Nor can there be any justification for damage to property, for threats, or for any kind of intimidation. Violence and destruction simply cannot be right. Instead we need a vision for cooperation, peace and love. Here's a great, international demonstration of peaceful cooperation, the song 'We don't need no more trouble'. This wonderful video will give you a better sense of the spirit of cooperation and fun that is available to us if only we will accept one another - not as black or white, male or female, wealthy or poor, Muslim or Christian or Hindu, but as people. How hard can that be? Yes, but - Oh - I should have mentioned something else. There is a cost to the goal of accepting one another in love. There is always a cost. The cost is that we (I, you) must make the first move. No matter the injustice or issue between us, we must forgive and move forward - for all our sakes. 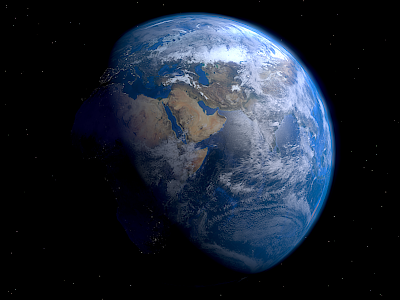 Let's remember, whatever our differences we are one people, all of us are related, one family, living on one Earth. Nothing should cause us to destroy one another. Nothing. In what ways can you, personally, reach across a divide in your own, local community? Have you been unjustly treated, hurt, ignored, overlooked, or picked upon? Why do you think it's so hard to make the first move in reconciliation? What will happen if nobody makes the first move? Discussion at the cafe today turned towards need and resources, and how churches and governments in particular might help when people are facing difficulty. We decided that they don't always do all they should. When that happens should we agitate for them to do better or just step in to fill the gap? I've been spending more time at Caffè Nero during the last few weeks. It's been good to get to know some of the guys there, there's a real social buzz about the place. Today there was some conversation about the need to help people in difficulty, we considered that traditional church has considerable resources that could be mobilised to help. I was reminded of a story my old work colleague, Phil, used to tell. Phil and his intrepid travelling companion Tony have covered a lot of ground together. They spent weeks and weeks in India one year, travelling light, depending on local hospitality, shunning the tourist scene and hotels, getting to know the people and experiencing India as it really is. Trip to Mexico - They did a similar trip to Mexico, and it was here that the story was based. One day they were in a square in Mexico City (I think). There was a cathedral in the square and they went inside to take a look. It was full of gold, expensive vessels, gilded statues, rich needlework and carved stone and wood. As they left the building they noticed a beggar who was not allowed inside. The cathedral was for rich people only, particularly tourists. The beggar was hungry, dressed in filthy rags, crippled, and needing help. 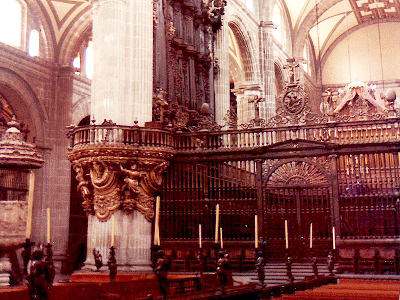 The contrast between the beggar and the riches inside the cathedral was extreme. 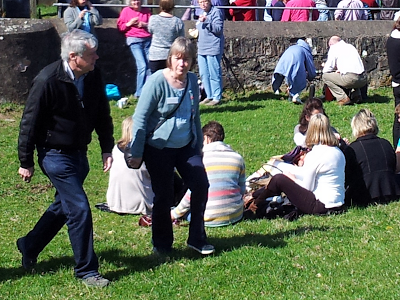 Phil and Tony walked away angry that such a situation existed and in deep sorrow. I can't even begin to describe the way they must have felt about church. Would you rather be the beggar or the bishop who manages the cathedral? It seems to me that each one of us is responsible for loving the people we see around us. Jesus didn't lobby the Sanhedrin or the Roman governor to do more - he just healed the sick, cast out demons, touched lepers, fed the hungry, and made extra wine for a wedding. I don't think the way forward is to criticise the government, the church, or the wealthy. I must do whatever I can to help anyone in need (whether that's for food, for a roof, or just for a friendly smile and a kind word). If we all did our bit, nobody would go short. Everyone can do something. It's not about resources, it's mostly about noticing and willingness to get involved. So the question is, what am I going to do about it and what are you going to do about it? We will all have to give an account of the way we have lived. When that time comes would you rather be the beggar or the bishop who manages the cathedral? How much influence do you have over organisations? Most of us have very little. Is complaining ever a useful thing to do? If so, explain why and how. What are the main barriers to helping people you don't know? Sandy Millar came as the guest speaker to the Great Ouse Filling Station. Interesting and engaging, he read Ezekiel 37:1-14 and reminded us of the need to be prayerfully active in reaching people with the good news. Making disciples is an essential part of following Jesus - after all, he told us to do it. Sandy Millar spoke at the Filling Station at Moggerhanger on Monday. Let's break that sentence down into its component parts. Sandy Millar... - Sandy is an interesting man. He is a great speaker, very engaging, relaxed enough to include plenty of stories and asides, yet focussed on the particular theme he wants to get across. Retired now, he began his career as a barrister and ended as an Anglican bishop. At one time he was the vicar of Holy Trinity, Brompton where he was largely responsible for the development of the Alpha Course and, later, the Marriage Course. ...spoke... - Past tense, you missed it. But it was good. Sandy spoke about Jesus' instructions to 'go and make disciples'. He read one of my all time favourite Bible passages, Ezekiel 37:1-14. Speaking life into dry bones is another way of thinking about disciple making. Sandy suggested that making disciples should be our main focus, it is our mission. Here are his five main points. Recover a new understanding of the lostness of the world. It will help us see our neighbours in a different light. Develop a new confidence in the gospel. Recognise that Jesus does have the necessary power. Find a new understanding of the uniqueness of Jesus Christ. He rose from the dead! We also need a new understanding of the urgency of evangelisation. We need to do good, we need to speak with people and pray for them. Pray over the dry bones. We need a fresh experience of the Holy Spirit. ...at the Filling Station... - Filling Station? What is that? 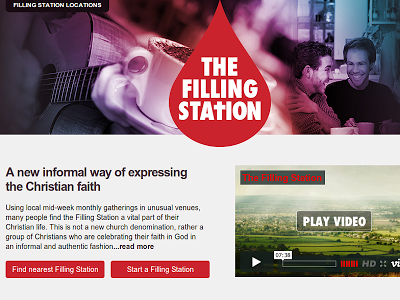 Filling Station is a parachurch organisation that runs local meetings to build and strengthen local church. It involves a time of singing and praise followed by an address by a guest speaker. Most Filling Stations meet once a month. The idea began in the West Country and has spread across the entire UK. Recently it has moved into Europe too. ...at Moggerhanger... - Weird name! Moggerhanger is a village east of Bedford, on the edge of the village is Moggerhanger Park where our local Filling Station meetings are held. We don't meet in the old house itself, but in the Garden Room, a separate meeting space in the grounds. ...on Monday - Just the day of the week. The meeting was on Monday 20th May. Are you aware of a Filling Station meeting near you? Do you have a sense of urgency about making disciples? What are you doing to make disciples amongst the people you know? Look at Sandy's five points again. What do they say to you, personally? How will you respond? Victor Choudhrie asks us to share all we have. The Old Testament tithe is neither necessary nor sufficient, everything we have is to be at the disposal of our brothers and sisters in Christ. Indeed, we need to reach out beyond even this and care sacrificially for the community in which we live. In his fourth step for transforming church, Victor Choudhrie suggests we drop the notion of tithing and begin to share all we have together. Replace Mosaic tithing with Christian sharing, thereby harnessing the enormous, financial resources, hospitality and goodwill available in Christian homes. If we've followed the first three steps we will already be meeting informally at home, and we are now being called to share everything in common. Practical caring - This may seem like another huge step, and in some ways it is, but the blow is softened a little when we realise that the little group of believers meeting at home is already very like a family unit. In our family lives do we hesitate to share what we have with one another? No! This one's lack is met by that one's sufficiency, what could be better or more natural? If a mother or father is willing to spend whatever they have for a son or daughter, or a son or daughter is willing to care for an elderly parent, why would a small gathering of believers be any different? It happens entirely without planning or weighing up whether or not to help or how much to help. Where there is need it will be met as long as there are resources to meet it. If the resources run out the family suffers the shortage together. So it must be in local ekklesia (church). We are family. Mosaic tithing - Under the law, the people were required to support the Levites and priests who had no land allocation in Israel. They would collect a portion of their harvest and animals and give them as an offering so that the temple worship could continue. We can legitimately argue that tithing is part of the old covenant, so if we disregard other old covenant laws concerning circumcision, not eating pork, ritual cleansing, why do we insist on retaining tithing? 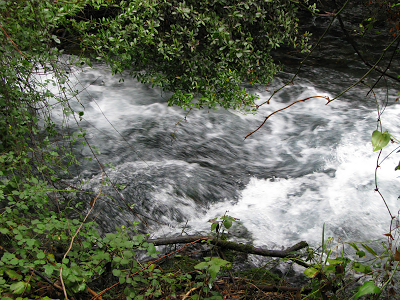 Just as the temple sacrifices have been met in full by Jesus' death so that we can now give ourselves as living sacrifices, and just as ritual cleansing has been met in full by Jesus' provision of living water, so too the tithe requirements have been fully met in Jesus who requires all we possess to support the royal priesthood of all believers. We really can't have it both ways. Either we are required to give a fixed percentage or we are called to give everything. Which will it be? Before answering that question consider very carefully whether you want to take responsibility for your own future or whether you prefer to cast yourself on Jesus' mercy and and his call to enter his kingdom here on Earth. Will you take the route of law or of grace? Is tithing law or grace? Is spending whatever you have to meet the needs of your brother or sister law or grace? Now make that choice - fixed percentage or all you have. The challenge will be to live by your choice. As it was at the beginning - In the earliest days of the church it's clear that everything was shared in common, at least in Jerusalem (Acts 2:44). This works well where everything is very informal. This is certainly the case for your family and it should also be the same in the local church. In places where there is oppression, persecution and danger it is the only way that works. Here in the West, however, church has often been modelled on business. Money is required for buildings, staff, equipment and programmes; funds are raised to support these things. We spend most of these resources on ourselves and the remainder goes on missions and helping the local community. We really need to turn this around so that the entire church becomes missional in nature, the mission is mostly local, and needs are met as they arise by everyone helping one another and sharing this kind of love more widely to friends, neighbours and colleagues. Probable responses - How will we feel about freely giving to those who need it? People may feel anxious that they won't have enough remaining resources for their own needs. There may be a belief that it's the church's 'job' to collect funds and administer them and that it's wrong to give directly into a need. But what does the New Testament say about that? Some of us might worry that others would take advantage of our kind heartedness. How should we respond to this fear? Are you willing to offer your time and your money to meet the needs of your brothers and sisters? Are you willing to offer your time and money to meet the needs of your neighbours? Are you prepared to divert funds from current church buildings, staff, equipment and programmes in order to meet the needs of those around you? 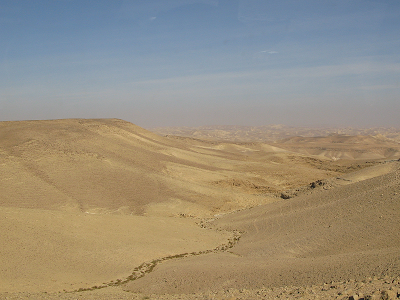 Jesus was cast out into the Judaean wilderness (an arid semi-desert). As an example of a good leader he was tempted and passed the test with flying colours. We need to be like him in that respect. Whether we are dealing with material things, the miraculous or worship, we'd better get it right. After he was baptised, the Holy Spirit led Yahshua (Jesus) away to be tempted. Because Yahshua is our King, teacher, master and Lord he is the prime example of a leader. He's a perfect example in every way. Therefore, in this study of leadership in the church, there is no better approach than to pay attention to what Jesus said and did. All of us are tempted, and it follows that all leaders are tempted, and because Jesus lived among us as a human being he was tempted too. So what can we draw out from Matthew 4:1-11? Spirit led - The prayer Jesus taught his apprentices includes the words 'Don't lead us into temptation but release us from evil'. So it may seem surprising that here in Matthew 4:1 we read that the Holy Spirit led him into a barren place to be tempted. All leaders suffer particular forms of temptation when they are in a barren place, so let's bear that in mind as we work through these verses. 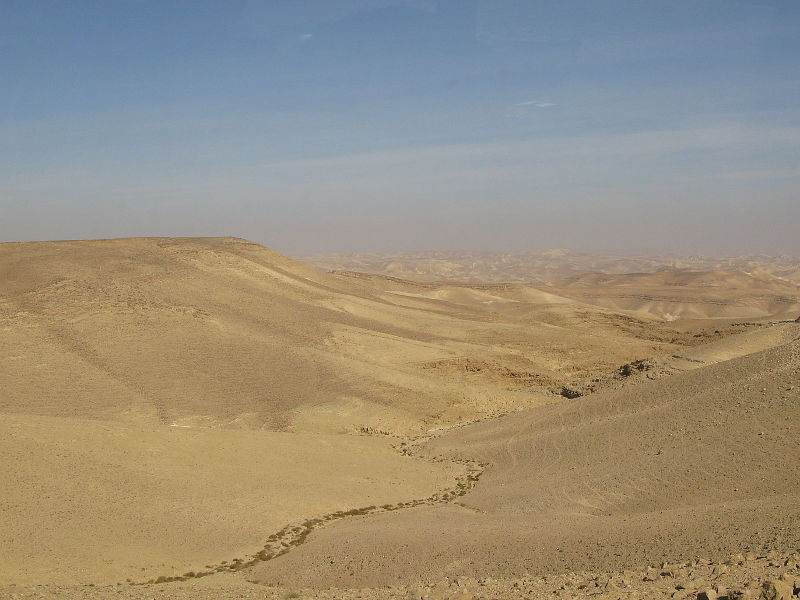 But let's also bear in mind that it's not necessarily wrong to be in a barren place. The Spirit himself may choose to lead us into and through such places in our lives, if necessary repeatedly. Something to eat - Jesus has come to the uninhabited, semi-desert country where there's little or nothing to eat, he's fasted for forty days and nights. And Matthew 4:2 states the obvious - he was hungry! In our places of greatest lack and when things are at their most desperate we may be tempted to take shortcuts. For Jesus, bread from loaf-shaped rocks would have been cheating, removing the temptation by means of a shortcut. But we don't grow by taking shortcuts; we don't feed just on bread, we feed on what Yahweh says. We must feed on his words of life. The first temptation is to be more concerned with bodily needs than with spiritual needs. Something marvellous to see - What could be more of a draw than a man jumping from the top of a high and significant building in the heart of a city and landing unharmed? This time the evil one actually quotes from the Old Testament to make his point! This is about impressing people. We are all tempted to do whatever it takes to get people's attention. For leaders this is always going to be a potential issue. Nobody is listening... OK then - watch this! Maybe I'm not going to jump off a building, but I might try loud, professional music or fancy artwork or special promotional offers. But once again we must resist. Jesus shows us the way to handle the issue, the evil one is capable of quoting from the Bible but he is always looking for a way to trap us. He made a double mistake; he tried to test the Son by getting him to test the Father. He may encourage you and me to test both the Father and the Son, but since that first Pentecost, we also carry in our hearts the same Spirit that is in the Father and the Son. If we are hearing from the Holy Spirit we will be just as hard to trick as the Son himself. We have a real advantage over the enemy. An offer to receive power - The enemy has dominion over the world and offers to give it to Jesus. But the price is far too high. Jesus will never worship anyone but the Father and neither should we. I almost feel sorry for the destroyer, he is already defeated and nothing he offers is of any real worth. He must be desperate to try a ploy like this! I will only accept what Jesus offers. I will worship him as he worships his Father. They and their Spirit are one and I will worship only the One. An issue for leaders - There's a serious consideration here for anyone who aspires to lead. It's bad to go astray. But to lead others astray is far, far worse. If I serve anyone or anything other than the Lord and others follow me, I am leading them into peril. If I worship anyone or anything other than the Lord and others copy me, I am leading them to worship false gods. We have here three examples, right attitudes to material things (bread), right attitudes to the miraculous (falling without being hurt) and right attitudes in worship (due only to the Almighty). These three stand for a host of other similar things - the stuff of life (daily needs, hobbies, worldly goods) - testing Papa ('look at me' in healing, prophecy, working of wonders) - worshipping false gods (money, power, fame). Who is worthy to lead? Who will rightly feed the sheep and guide them? If you set an example the sheep will follow, so make sure your example is a sound one! Jesus was tempted in body, mind and spirit. Can you think of examples from your own life? What clues does Jesus' example offer concerning good strategies to avoid sin? How long do you think you could survive in the desert? We all lead and we are all followed. How can you be sure to set good examples in your life? CS Lewis wrote two books that may help us to understand pain and suffering. The article includes some quotes from one of the books and then offers some advice for those intending to spend time with a person suffering emotional pain or loss. This month's Synchroblog is on being with those suffering pain. CS Lewis wrote a book entitled 'The Problem of Pain'. In it, Lewis explores pain as it relates to an omnipotent and loving creator. The book was popular in his lifetime and has since become such a classic that it's still in print and available as an e-book too. What follows below is a series of quotes from Lewis's book with short comments from me. Mental pain is less dramatic than physical pain, but it is more common and also more hard to bear. The frequent attempt to conceal mental pain increases the burden: it is easier to say 'My tooth is aching' than to say “My heart is broken. CS Lewis was no stranger to pain. Long after writing these words his wife, Joy Davidman, died (just four years after their marriage). He wrote another book about that experience, 'A Grief Observed'. Both books are worth exploring. Love may forgive all infirmities and love still in spite of them: but Love cannot cease to will their removal. Lewis correctly sees that this is true of all love, both human love and the love of the eternal Father. The human spirit will not even begin to try to surrender self-will as long as all seems to be well with it. Now error and sin both have this property, that the deeper they are the less their victim suspects their existence; they are masked evil. Pain is unmasked, unmistakable evil; every man knows that something is wrong when he is being hurt. This, I think, is profoundly true. We need to remember this wisdom when we are suffering pain, and we need to remember it even more when we are free from pain. Try to exclude the possibility of suffering which the order of nature and the existence of free-wills involve, and you find that you have excluded life itself. This connection between pain and free will is extremely deep. The universe is predicated upon chance events and freedom to act independently. But this freedom is essential and makes love possible. If we are to love we must choose to do so, if we had no choice it wouldn't be love at all. ...when pain is to be born, a little courage helps more than much knowledge, a little human sympathy more than much courage, and the least tincture of the love of God more than all. I think Lewis has this absolutely right, do you? The first essential is surely that we must approach every person with unique sympathy. Sym-pathy... the 'sym' part of this word means 'with' and 'pathy' is 'suffering'. If I cannot 'suffer with' you in your pain I have no sympathy. It is better for me to come and cry with you than to come saying, 'Cheer up, put a smile on your face, it could be worse'. Job didn't need speeches from his friends, he needed them to sit there on the ash heap beside him. And the idea of leaving the person alone is not a good one either! Just because it's better to be quiet and not attempt to 'fix the problem' doesn't imply that it's best to be absent. I would suggest that the right way to respond includes being there and that it includes listening. It may well involve offering an arm or a shoulder or a hug. And it may involve simple practical things like making a cup of tea, bringing a meal, looking after a child or a household pet. It probably doesn't include giving advice, being cheerful, or finding distractions. It does require understanding without necessarily intervening, and it also demands patience and gentleness and the wisdom to speak, be silent, act, or remain inactive in appropriate ways at the right moments. It will not involve cajoling or nagging, theorising or explaining. All of this sounds complicated and difficult. But the essence is simple, it is to understand without needing to be understood in return. Prayer is good, but pray for yourself as much as for the other. Pray for insight and for prompting from the Spirit. Be prepared to pray inwardly much more than aloud. You will help just by being there. But be sensitive and alert for signs that you should leave and return later. Aim to be a blessing, not an additional burden or an irritation. Carol Kuniholm writes from deep within her heart about this topic, don't miss what she has to say in 'Like a motherless child'. Have there been painful times in your own life? Can you draw on those experiences to enrich your sympathy for others? Do you see why your presence and listening might be so helpful? Three of us spent two days in south-west Wales at a Ffald-y-Brenin Blessings Conference. We heard a great deal about the biblical basis for blessing, in particular how we are responsible for blessing the people and places where we live out our daily lives. Ffald-y-Brenin is the little place in Wales that's become the epicentre of a worldwide movement of blessing. I was there with my friends Sean and Jim for the Blessings Conference where Roy Godwin presented a series of sessions on blessing people and places. They have been learning to do this from the retreat centre at Ffald-y-Brenin and now they want to share what the Holy Spirit has been showing them. Roy provided extensive biblical context and backup for everything he said, and all of this material was presented in written form too. I also took my own notes and I'll share some thoughts that really stood out for me. The mercy and grace of Yahweh are paramount and are foundational for our lives as followers of Jesus. Much truth about blessing has been lost and is being rediscovered. Blessing is about life (it's not merely a formula). We can only bless because we have been blessed. Out of a place of blessing, we can bless others. We shouldn't get caught up in lifeless religiosity, instead we engage with what brings life. The Father says 'I like you' as well as 'I love you'. He knows us intimately and yet he is still for us. We are appointed under blessing to a place, a relationship and a role (Genesis 1:26). Entering the place of his blessing is to come back home to the place where we were always meant to be. Deuteronomy 28:1-14 is clear that we have blessing in every place, over everything, in all we do - but we have to listen and obey. John 8:56 - Jesus is the fulfillment of the promise to Abraham (Acts 3:25, Gal 3:7). We can start with a blessing and look for a person to give it to; or we can start with a person and look for a blessing to suit them. Roy suggests a helpful form of words, 'I bless you in Jesus name that ...' (Replace the three dots with something specific.) It's not a prayer request, it's much more a proclamation of Father's love and grace, mercy and peace. The work at Ffald-y-Brenin - This has touched individuals, groups of people, places, businesses, farms, countryside, towns, cities, villages, farm animals, grass, homes, families - you name it. You can read more in the form of extracts from the book, 'The Grace Outpouring'. Better yet, get a copy of the book and read it in its entirety. We weren't exactly visiting Ffald-y-Brenin this time (we did that two years ago). 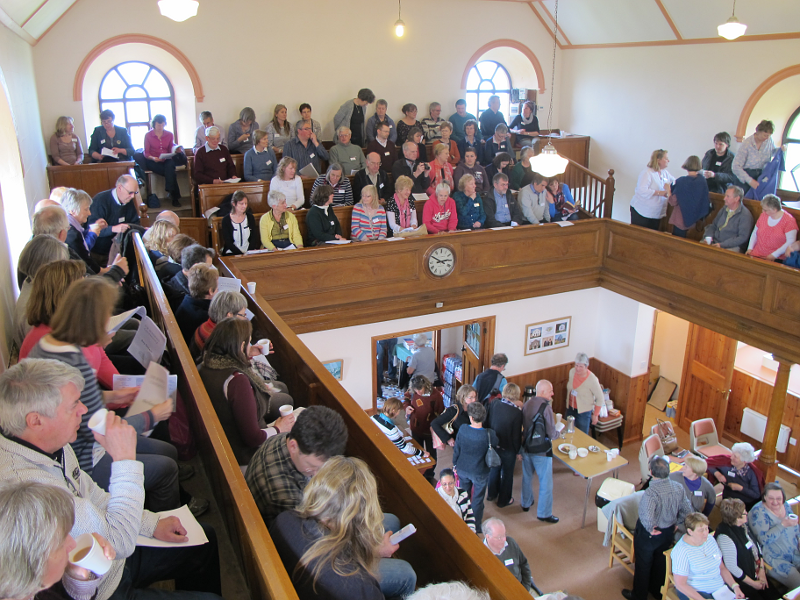 The Blessings Conference involved too many people for the centre itself and instead we met nearby in Caersalem Chapel (photo above). The name is a hybrid of Welsh and Hebrew. 'Caer' is Welsh for fort or fortress while 'salem' is a form of 'shalom', Hebrew for peace. So Caersalem means 'fortress of peace'. It is also an older Welsh name for Jerusalem and it would be in this sense that it was chosen as the name of the old chapel. It was a great meeting! Sean, Jim and I travelled down by road from Cambridgeshire (about six hours driving), the meeting began at 14:30 on Tuesday and we stayed overnight in a golf club (a delightful place by the sea). The sessions ended at 16:00 on Wednesday and we headed home, arriving back in the evening. How often do you deliberately bless those around you? Can you best bless people and places by your actions, by your words, or by both? Identify someone you know and prayerfully consider what would be a suitable blessing. Why not go and speak that blessing over them? Why not aim to repeat this with a new person weekly, or even daily? In their book, 'The Shaping of Things to Come', Frost and Hirsch point to Jesus' Jewish background as key to understanding his life, death and his mission. Any attempt to understand him based on Romano/Greek culture or 21st century western culture will cause distortions to the truth. 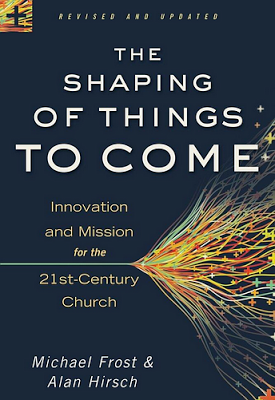 I'm currently reading The Shaping of Things to Come by Michael Frost and Alan Hirsch. Here's a brief quote from Chapter 7. ...the Jewish heritage is the primordial matrix out of which Christianity was birthed, and which we would argue is the only matrix out of which it could be organically understood in its fullness. Except for Luke's writings (he was in all likelihood a proselyte of Judaism), the New Testament is a document written by Jews. Therefore biblical Christianity's 'genetic code', its kinships, its plausibility structures, its genius, are all Hebraic to the core and back. The point is this. Because Jesus is a Jew, rooted in Jewish society two thousand years ago, if we want to truly understand him we need to view him, read him, hear him and watch him in action from a Jewish perspective. Not to do so is to risk misunderstanding much that he said and did. And what is true for Jesus is also true for his church; this comes out clearly in the extract above. Have we missed something? - Perhaps this is something the church has overlooked over the centuries. We have often tried to understand Jesus in terms of the Romano/Greek culture of his day or in terms of today's western culture. But neither of these is appropriate and both may mislead us. How are we going to tackle the task of refocussing and recalibrating? A good place to begin is by reading and re-reading the gospel accounts of Matthew, Mark, Luke and John. Perhaps a rhythm in which these books are read regularly might help us. The Shaping of Things to Come is a good book, even a great book. It examines the phenomenon of church in a new light and shows the developing western model of the past 1700 years to have been missing the mark. It's accessible, enjoyable to read, and should provoke much thought. The book was published in 2003 but a new edition is now available. How often do you cover the gospels in your Bible reading? What might the effects be of taking Jesus out of his historical context? 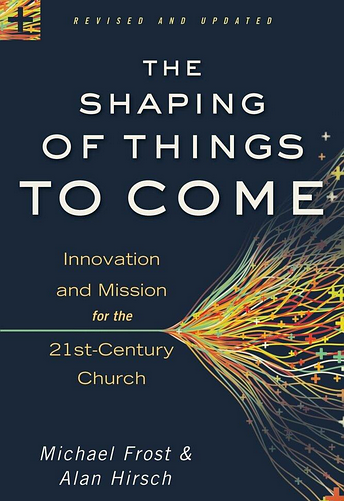 Have you read 'The Shaping of Things to Come'? If so, would you leave a comment sharing your thoughts about it? Chris Hadfield has a better view from his window than most of us. He has been living and working on the International Space Station and has been active with a camera in his spare time. This recent example is typically stunning. Enjoy! Chris Hadfield is a Canadian astronaut, soon to end his command of the International Space Station (ISS). During his tour of duty he's been an active photographer, taking and publishing dozens of stunning images of the Earth. Here is a recent image showing city lights in the south-eastern part of the USA with the Moon rising above a small slice of blue sky on the horizon. Chris has a good eye for composition and every picture he publishes has been excellent and breath-taking. 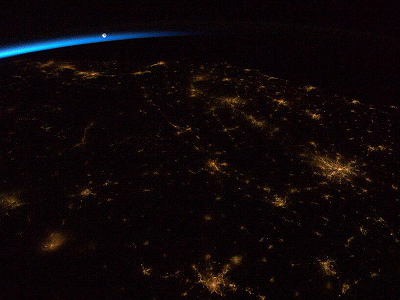 He's been publishing these images from the ISS using his Twitter account. Isn't it amazing how 'normal' life in orbit has become? Another favourite activity for Chris has been making videos demonstrating the effects of weightlessness in response to requests from people back on Earth. If orbital flight was cheap, would you enjoy a holiday in space? If you could take just one photo on your space holiday, what would it be? John the Baptist came to prepare the way. We can learn about the purpose and right mode of leading from John. Like him we are to prepare the way for Jesus, encouraging people to see their need of cleansing and purity. Like John we must go first and when Jesus comes we do whatever he tells us. In Matthew 3 we read about John the Baptist. John was a relative of Jesus' and he came to prepare the way for the coming Messiah. He lived an unusual life out in the wilds, told anyone who would listen that they needed to turn away from every bad thing in their lives, and washed them in the River Jordan to make them pure. He told the religious leaders that they should not make assumptions about their purity but must instead demonstrate it by producing good fruit in their lives. He explained that a greater one was coming and would separate the valuable crop from the worthless waste. So when Jesus arrived and asked to be washed, John objected at first. When he did baptise Jesus the Spirit of the Most High rested on him and a voice said, 'This my Son whom I love, I'm very pleased with him'. Leading people - So what is going on here, and what can we learn about leadership? John prepared the way and led people to a place where they were able to respond to Jesus. This should be the goal of everyone who leads. John's example shows us that we need to draw people from where they are now to a place where they can respond to Jesus and be made pure. This is just as true for believers as it is for people who have not yet met Jesus. No matter how far we have come there is always the potential to take another step forward. If anyone wants to lead, that person should prepare the way for Jesus. Smooth the way, straighten out the lumps and bumps so that there will be fewer obstructions that might prevent a person coming closer into his presence. It's not our place to do Jesus' work, it is our place to prepare people, to show them that they are not in a good place, to let them know that someone is coming who will sort out the good from the bad, the spiritually profitable from the unprofitable, the harvest from the waste. Our job is to point to Jesus as the coming King and then to get out of the way so that everyone can hear and see the Light of the world for themselves. One of the most powerful ways we can do this is by becoming living examples, showing people the way and not merely telling them. This is the real meaning of the word 'leading', it's a matter of going ahead so others can follow. Choosing or chosen? - John did not choose or select those who came in repentance and for washing. They chose and selected themselves. He baptised the humble folk and the distinguished leaders alike. Neither are we to pick and choose those we come into contact with, we must be willing to share the good news with anyone and everyone. John did object to washing Jesus because he knew that he was already pure. But when it was clear that this was Jesus' purpose, John relented. Once again, John sets us a good example. If Jesus shows you clearly to do this or avoid that then you had better hear him and obey! If anyone chooses to follow Jesus we must accept them joyfully and baptise them in the name of the Father, the Son and the Spirit. If we are to lead we must do it in utter humility just as John did. We don't dress in fine or important clothes, we have no position or authoritative power. We eat the lowliest of food and live in the simplest of homes. We meet people where they are and we tell them that Jesus is for them and loves them and wants to know them and spend time with them. We bless them and we leave them in his capable hands. We pray for them, we visit them, we encourage and help them and the little seed of new life within them begins to grow and flourish. Do you think people learn more deeply from instructions or demonstrations? Why? Justify your answer to the first question. John used both words and actions. Can you identify examples in Matthew 3? You can plant a seed and water it. But can you cause a seed to grow?